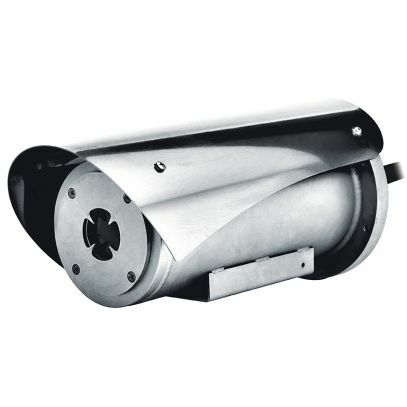 The explosion-protected MAXIMUS MVXT thermal camera is perfect for effective video surveillance and process control in harsh settings where the presence of gases or flammable dust can create a potentially explosive environment, a reality often found in the oil and gas industries or marine and industrial sectors. The thermal camera is able to detect a person or an object in the most difficult environmental conditions, such us total darkness or other levels of lighting, heavy smoke, rain or dust and across long distances. One striking advantage offered by these cameras is their extremely easy and secure “plug and play” installation, with multipolar wiring. These cameras arrive ready to use, avoiding the complex electrical connections that are typical of this type of device. The housing is compact yet functional and is made entirely out of AISI316L stainless steel. Its resistance to corrosion is not only guaranteed, but is also enhanced by way of polishing processes. Another important feature of the camera is the extended certification temperature range of -60°C to 65°C, along with a sophisticated cold start system, which allows it to operate in harsh environments as standard. An equally noteworthy point is that the IP66/IP68 ratings guarantee the complete protection against harsh weather and submersion in up to 5 metres of water for 2 hours. Moreover, the IP69 rating allows the device to be cleaned with high pressure water jets. The MAXIMUS MVX range of cameras meets every installation need, providing maximum performance and excellent value for money. The MAXIMUS MVX series products are Lloyd's Register Type Approval System Test Specification Number 1 certified and therefore can be used in Marine and Offshore applications for environmental categories ENV1, ENV2, ENV3 and ENV5 (eg. passenger ships, open-air decks, closed spaces and technical areas that may be subject to heat generated by other equipment, potentially explosive areas, docking procedures).